Yesterday we speculated that we'd get our first look at some footage from the Assassin's Creed movie soon, and now we know exactly how long we have to wait; According to the LA Times, the first trailer for the highly anticipated movie will debut tomorrow. In the meantime, 20th Century Fox have unveiled two more stills from the video game adaptation. The LA Times article also features a quote from the film's star Michael Fassbender, who notes that the movie is treating the game that inspired it with "a healthy dose of respect and disrespect". That notion is echoed by director Justin Kurzel; "I spent most of my time with the story and the real history. That was my main focus – not so much forensically going through every aspect of the game. It was: How do you make this into a piece of cinema?" 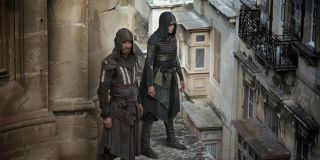 We'll get a glimpse of just how similar and/or different the Assassin's Creed movie will be from the game when the trailer is unveiled tomorrow.